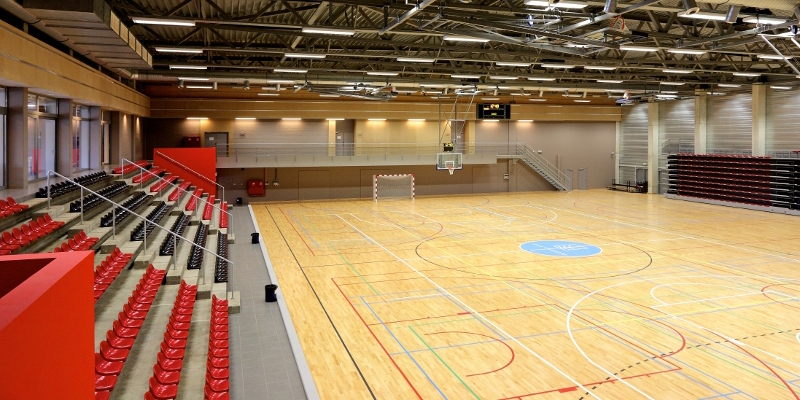 The transformation and extension of the sports center was the subject of a competition aiming to bring its facilities up to the national division 1 and the international basketball federation standards (European championships). on the first floor, the new VIP corner with kitchen area and concierge service. enlarging at each level the martial arts and gymnastics spaces about 175 m². In order to undergo this heavy transformation, a large number of various structural techniques have been implemented, i.e. : underpinning, reinforced and pre-stressed concrete, steel structure, long span laminated timber beams, etc. The roof of the existing hall (28 m span pre-stressed concrete beams with variable inertia) has been dismantled while the peripheral columns have been heightened and a 40 m span new metal roof has been placed. A new joggled floor slab extends the existing slab and a new parquet floor covers the entire surface of the new hall. The VIP area is located right next to the existing façade of the old hall. This is the reason why the foundations of the new construction required underpinning works. The ground floor, besides the new area with the cloakrooms and the administrative offices, offers an access ramp for disabled people and for logistics. This area floor is dedicated to the VIP area in all its functions: reception desk, meeting and reception rooms, cafeteria, etc. A cantilevered exterior balcony surrounds the entire outer façade and offers an exceptional space for the organization of summer events.